It was a hot Saturday afternoon in Toronto. That didn’t stop the Jays however from bouncing back from a 10-2 loss Friday night at the hands of the Orioles. 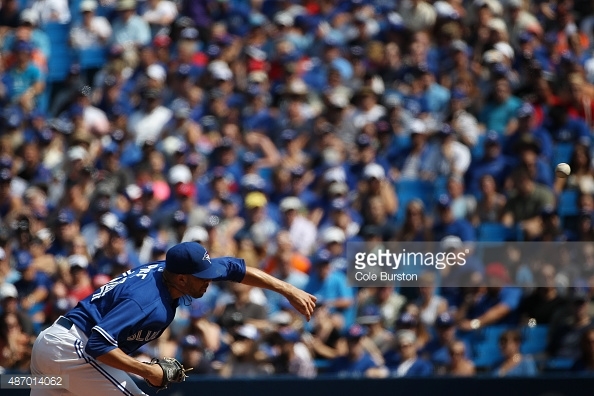 In game two, the Jays were lookin for a win before facing the O’s in the finale on Sunday. Bautista would help get things rolling by launching a solo home run on a 2-2 count. The Jays would then score four more making it a 5-0 game by the start of the sixth. The Orioles would get one on the board in the seventh when Caleb Joseph would single to left, scoring Chris Davis. That’s all they would get though, as they would fall to the Jays 5-1. A key part of the win for the blue birds was the man on the mound, David Price. Price was not only looking for a win in today’s matchup, but he was also looking for win #100. With seven strong innings pitched, he was able to do just that. Price allowed only one run and three hits over seven shutout innings. The left-hander walked four, matching a season high and striking out eight. Since joining Toronto at the trade deadline, he is 5-1 with an impressive 2.15 ERA. After the game, there was some scoreboard watching for fans, and more then likely some of the guys in the clubhouse. The Yankees were only half a game back heading into Saturday’s matchups but were facing a loss at the hands of the Tampa Bay Rays in their matchup. Sure enough, things went how they wanted, as the Yankees loss 3-2 putting them back to a game and a half behind the AL East leading Jays. Both clubs will face off in their respective series finales. For the Jays and Orioles, it will be Marco Estrada (11-8) facing off against the right-hander Chris Tillman (9-10) For the Yankees and Rays; it will be Ivan Nova (5-7) going up against Chris Archer (12-10). Interesting fact, Chris Archer is undefeated at Yankee stadium posting a 3-0 record with a 1.54 ERA in five career starts in the Bronx.